L.A. Endocrine Care (LAEC) was established by Dr. Diana Echeverry-Franck, or Dr. Echeverry, in 2007, as a clinic focused in the Endocrinology specialty. The clinic offers specialty care in Diabetes Mellitus, Thyroid disorders, and general endocrinology. Dr. Echeverry is board certified in Endocrinology (American Board of Internal Medicine). 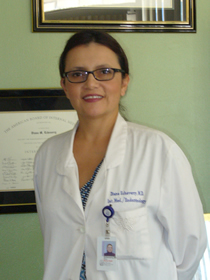 An hispanic female, born and raised in Los Angeles, Dr. Echeverry is bilingual in Spanish and English as is all staff at L.A. Endocrine Care. All providers are trained under Dr. Echeverry's philosophy of nurturing care and cultural understanding. All providers strive at improving compliance with their treatment and removing barriers to diabetes care. This can only happen when a relationship of trust is formed with the providers. This trust is only formed with time and patience. With over 1000 patients followed in our clinic to date (2011), we hope to grow more and provide the service to more patients who have a need for our services. L.A. Endocrine Care manages menopausal issues such as symptoms of menopause, osteoporosis prevention and treatment, sexual functioning and aging.